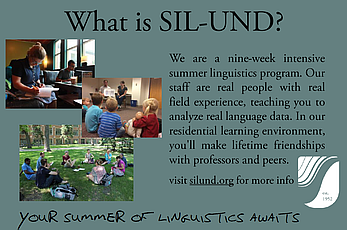 Help spread the word about SIL-UND! We have several publicity pieces in PDF format that you can download, duplicate, and distribute. 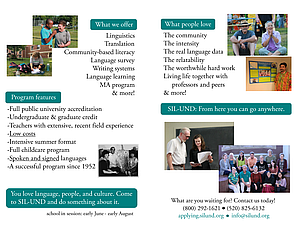 Full-color brochure (about 635kb): Duplicate these pages back-to-back, then fold in two with the SIL-UND logo and “Your summer of LINGUISTICS awaits” as the front page. 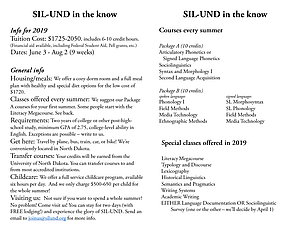 Due to its expense, best to reserve it for people who already show some significant interest in taking SIL courses, e.g. in one-to-one contacts. B&W Insert for full-color brochure (about 250kb): Duplicate this page back-to-back and cut in half. 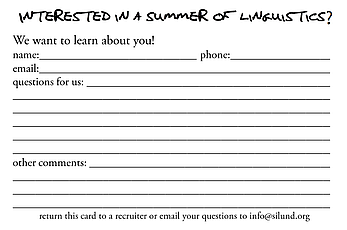 Insert it in the full-color brochure to provide extra details about the coming summer. Good as a basis for conversation with an interested prospective student. Grayscale flyer (about 330kb): Duplicate this page back-to-back and cut in half. Especially effective if you have colored paper that is close to the teal in our logo. 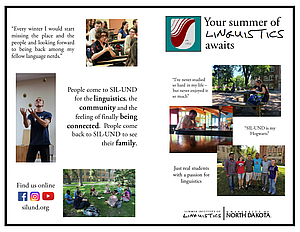 Much less expensive to duplicate than the full-color one, thus suitable for mass distribution to classes or other larger groups of people who may be hearing about SIL for the first time. Response card (about 270kb): Duplicate this page back-to-back on card stock and cut each sheet into 3 cards. Good for collecting information about people who are interested in the program. 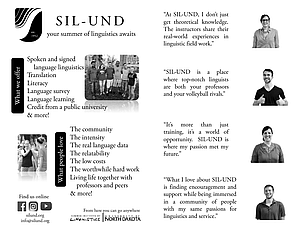 When you collect these after people fill them out, please scan or photograph them and send them to info@silund.org.